2017 X-Yachts Xp 44 The Xp 44 combines impressive performance with simplicity of handling, appealing to all the family. This model was the first of the Xperformance line to be launched, and was named Sailing Worlds Yacht of the Year in 2014. A highly optimized hull shape offers exemplary performance in a range of wind conditions, on all angles of sail, under both ORC and IRC handicap systems. Key elements of the hull design include reduced upright beam and wetted surface area, while the transom shape ensures that as wind speed builds and the boat powers up, the overall waterline length increases for additional speed. Additional performance is gained through the Xp 44s exceptional stiffness and high stability, achieved by a high ballast ratio with additional weight in the keel bulb keel, and lightweight structures thanks to epoxy infusion build processes. The Xp 44 introduced the innovative Xperformance bowsprit, with options including a carbon bowsprit to set asymmetrics, a GRP cowling, and optional anchor attachments for hassle-free cruising. 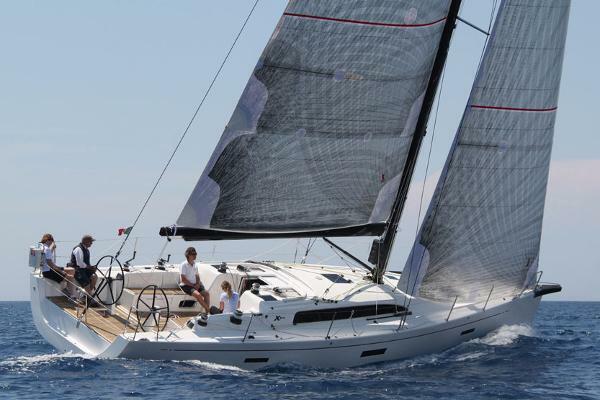 The Xp 44 is supplied with an aluminium rig as standard with carbon mast and boom as an option, both developed in conjunction with leading sail makers to create an efficient, easily adjustable sail plan. The Xp 44 also carries multiple halyard options to allow owners to optimize their boat for racing or cruising, inshore or offshore. Standard deck features include a below decks furling drum, low friction racing blocks, and large self-tailing winches (powered winches optional). The Xp 44 also introduced the Xp ranges adaptable new sliding navigation station, supplied as standard, which allows for additional seating or a forward-facing chart table. 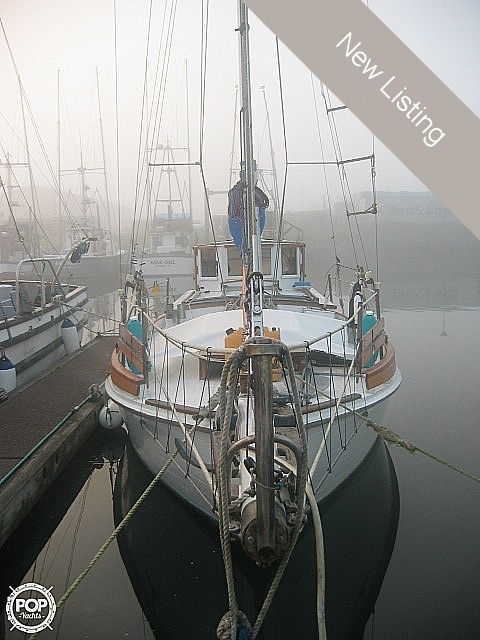 It is also offered with a fixed chart table option and wooden galley. The three-cabin layout includes symmetrical double aft cabins, a forward cabin with en suite heads, L-shaped galley (now available in a new wooden finish option as shown above), additional heads accessible from the saloon, and spacious seating area around a removable saloon table. Flush-mounted hatches and stylish LED lighting creates a light and welcoming space, day or night. 2016 X-Yachts Xp 33 The smallest yacht in the range, the Xp 33 is designed for pure sailing enjoyment. 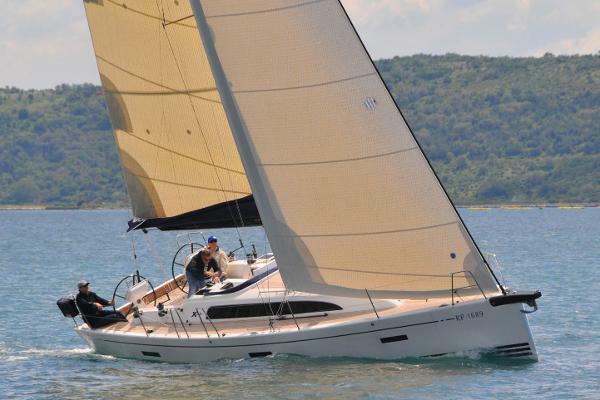 This model is a high stability 30-footer which benefits from the same advanced construction techniques as the larger yachts in the Xperformance range for superb sailing performance and build quality. Smooth lines, ample buoyancy both fore and aft, a plumb bow for maximum waterline length and subtle chines create a hull which is fast on all angles of sail. 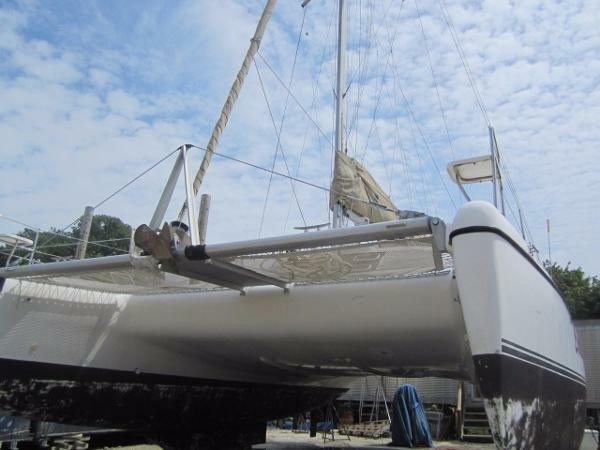 A custom-designed double spreader aluminium mast is offered as standard, with a carbon rig available as an option. 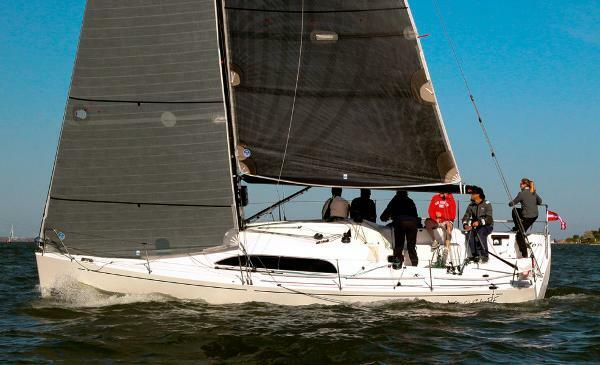 Non-overlapping headsails, a single line headsail furler and retractable bowsprit increase the sailing fun and racing potential while ensuring sail handling is stress-free, even when sailing short-handed. 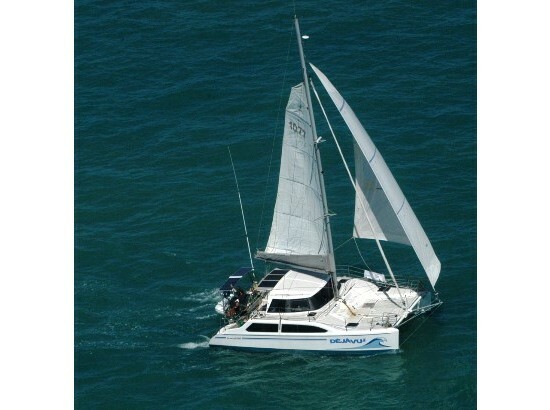 2005 Jaguar 36 Catamaran GRP catamaran; Jaguar 36 Sailing Cat, Built in 2005 in by SA in South Africa, Dim. : Loa 11,03 m x 7,00 m x 1,00 m, mast height: 16,70 m. GRP hull, superstructure and deck, Lloyds approved balsa core construction. Opening hatches + mosquito screens in saloon, head, aft cabin and owner's cabin, wrap around safety glass windows of 10 mm windows in saloon, four opening ports per side, mosquito screens. Sliding door (with extra thick safety glass) with folding mosquito door. The front beam is an aluminium compression member that supports the forestay bridle, with walkway from forward hatch to front beam with the two plastic coated nylon trampolines. GRP toe rail moulded into deck. Cockpit: stainless steel targa bar and walkway, anti-skid moulded into decks and coach roof, aft double seating in stainless steel and GRP. Deck lockers: 1x bow + 1x cockpit + 2x on dive platform. Fresh water capacity: 250 litres in epoxy tank, water maker - capacity of 22 litres per hour) Fuel capacity: 249 litres (epoxy tank) + two day tanks with 100 litres each. Steering gear: hydraulic steering system, two rudders linked together by on stainless steel tie bar, helm seat.Charters Cats has established itself as a benchmark in cruising catamarans. Achieving an unmatched alchemy between safety, comfort and performance. 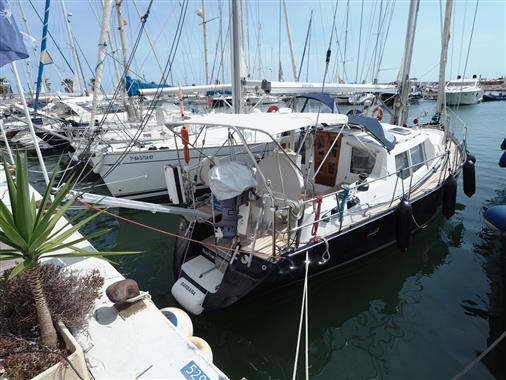 1980 Hunter Cherubini 27 - PRISTINE! Mary Jane is possibly the nicest completely original Hunter Cherubini 27 you'll ever find. Just about everything has been been gone through, refurbished and impeccably maintained. Previously owned by a Naval engineer, we purchased her in 2013. She'd been sitting on hard in Connecticut for 6 years. 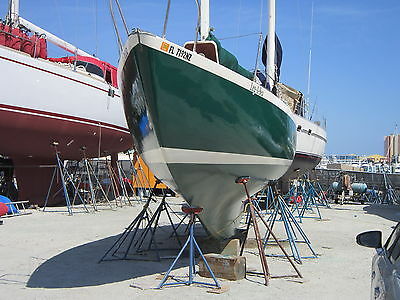 We had her trailered to our boat yard in Northport, Long Island and went to work on her. In the Summer of 2014 we took her out for a 2 week "shake down" cruise crossing the Long Island Sound 4 times, to Shelter Island through the Plum Gut (a notorious passage between Plum Island and Orient Point, the northeastern most point of Long Island). She performed beautifully. Cherubini Hunters are prized among serious collectors for their classic lines, speed and agile performance. Noted for Danish Modern style interior cabins the Cherubinis are astutely laid out and extremely comfortable for extended cruising. 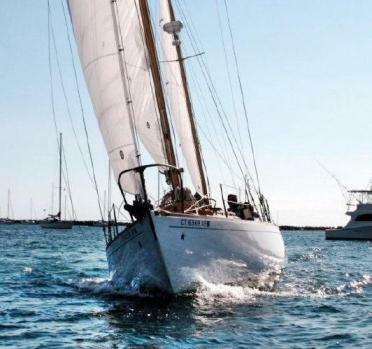 Mary Jane's original owner installed a custom made teak "traveler" for precise control of the mainsail in any weather condition (a real bonus). This Hunter 27 boasts the original Renault Marine Couach, 8 hp, one cylinder diesel engine, known for its dependability and unique rhythmic sound. I often liken the sound to that of the African Queen. 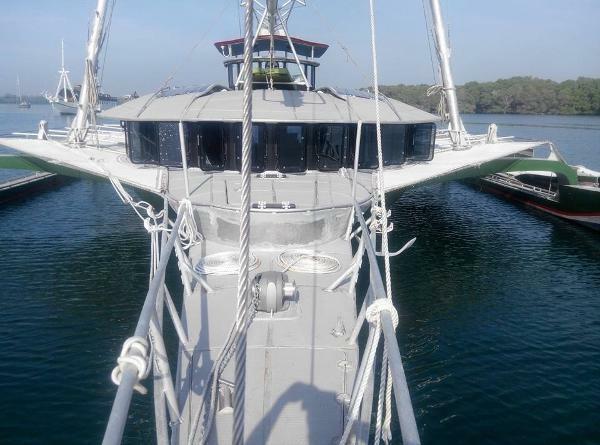 The top deck is painted with Interlux Brightside Seattle Grey epoxy (2014). All the teak hand and rub rails have recently been sanded and varnished with 6 coats of Marine Spar Varnish (2015). Last year the bottom was sanded and painted with 4 coats of Pettit brand Hydrocoat black hull paint (2014). This year we painted another 2 coats of bottom paint, just for good measure (2015). This year we also replaced the Datamarine depth and knot meters with brand new Moor depth and knot meters (2015). A new Ritchie Helm Compass was installed last summer (2014) and all new Black Sunbrella Mainsail, Compass, Steering Wheel and Winch Covers were installed just this month (2015). The following is a list of some of the items we've replaced and installed: Engine - new water pump (2014), new water pump seacock hose (2014), new starter motor (2014), new custom-made fuel lines (2015), new Racor fuel/water seperator (2015), new and extra Mann fuel filters (2015). Electrical - 2 new deep cycle Kirkland batteries (2014), new Cabella "ship to shore" battery charger (2015), new 700 watt power inverter (2014), new in-cabin fresh water pump (2014), new bilge pump (2014), new cabin light bulbs (2014), new illuminated mast-top wind vane (2015), new Moor lighted LED knotmeter (2015), new Moor lighted LED depthfinder (2015) Topside - New "Ritchie" Helm Compass (2014), 100 ft. New Red Jib Halyard (2015), 100 ft. New Black Mainsail Halyard (2015), new white and red traveler sheets (2015), new black Sunbrella fabric mainsail cover (2015), new black Sunbrella steering wheel cover (2015), new black Sunbrella compass cover (2015), 3 new black Sunbrella winch coversBrand New Magma 15" Kettle BBQ (2015). Cabin - (2015) interior cabin floor sanded and sealed with 4 coats Marine Spar Varnish (2015), in-floor bilge hatch cover sanded and sealed with 4 coats Marine Spar Varnish (2015), aluminium bilge hatch trim sanded and polished (2015), bilge interior painted and keel bolts sealed with 3M 5200 sealant (2015), brand new bilge hoses (2015), original "V" Berth cushions, 2 main cabin cushions and aft berth cushions Steam cleaned and Scotchguarded (2015), , all 3 winchs rebuilt and greased (2014), all ceramic porthole knobs replaced (2015), Kenyon alcohol stove rebuilt (2014). Mary Jane comes with lots of extras, too numerous to mention, including dock lines, fenders, life jackets, deck cushions, Windscoop, etc. 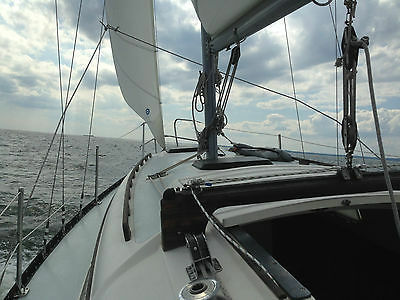 She's a joy to own and a pleasure to sail. All lines lead to the cockpit for easy single handling. Mary Jane is currently moored in Centerport Bay. The mooring and launch service is fully paid through the season, so if you're ready to go, she's ready for you. Whether you're just learning to sail or downsizing, you'll fall in love with Mary Jane. .
KEY FEATURES:BRAND NEW BRIGHT SILVER $180K COMPLETE PAINT JOB! !ASEA 18KVA WORLDWIDE SHOREPOWER FREQUENCY CONVERTER!! STERN GARAGE WITH NEW AB 9 VL TENDER CUSTOM UMT LAUNCH ROLLER SYSTEM! !SUPER EASY DOCKING WITH BOW AND STERN THRUSTERS! !VERY LOW HOURS ON RELIABLE AND QUIET MAN 1550 V12'S! !CUSTOM ONYX FLOOR IN THE GUEST FOYER AND NEW CARPET THROUGHOUT! !ONBOARD MOVIE DATABASE WITH OVER 1000 MOVIES INSTALLED! !ALL LIGHTS UPGRADED TO LED! !FULLY SERVICED AND IN TURN KEY CONDITION! !TOO MANY CUSTOM OPTIONS TO LIST!! MOST UNIQUE CUSTOM 64' PERSHING ON THE MARKET TODAY! !DONT MISS THE OPPORTUNITY TO OWN THIS ONE OF A KIND 64' PERSHING! !Aft DeckBoarding the Aft Deck you are greeted with a perfect setting in which to enjoy moments of relaxing conversation against the ever-changing backdrop of the sea. Ergonomically designed you will find all the necessary amenities close by for whatever the occasion calls for. This open Mediterranean style aft deck is an absolutely magnificent lounge and alfresco dining location. A built in center-line settee that can easily accommodate 8 guests. Large door opens the the aft deck to the salon and the combination creates an expansive entertaining area!Teak decksStorage, side panels – portTable, teak, in cockpit(2) Waterproof speakers with independent volume control(7) Ceiling lights - Upgraded to LED(12) Courtesy lights for stepsStainless steel gatesStorage compartmentsAccess to crew quarter through aluminum ladderAccess to engine room through aluminum ladderGRP furniture port side with sinkGRP sofa with seat and backrest in white vinyl fabricHideaway sliding hard top portionSunpad with seat upholstered in white vinyl fabricMain SalonAn unprecedented expansive entertaining and lounge area! The salon on this Pershing is the perfect vantage point to enjoy the vista. This exclusive living space is distinguished by sophisticated interior styling to satisfy your every need while on board. Exquisite finishes combined with a rich comfortable feel.Starboard side u-shaped settee in frau leather(11) Ceiling lightsAccess to the galley trough a GRP stairway with Wenge stepsAccess to the night area trough stairway with Wenge steps with courtesy lightsAudio-video system: - Bose hi-fi system - 26” LED TV hideaway in port furniture - XM Radio - Onboard Wifi - Mac Mini with Movie Server and over 1000 movies - Intellian Satellite TVCeiling covered in poltrona frau leatherCeramic set for 6 peopleChaise longue in poltrona frau leatherCutlery set for 6 peopleDigitally controlled a/c systemGlass set for 6 peopleLight switchesLighting stripe under windshield carterNatural teak holder for glasses and platesSliding hard top portionSofa in poltrona frau leatherStructural GRP floor covered in WengeUnsealed oak wood furnitureWith opening doors and shelvesUp & down dining table in unsealed oak woodCorridor to access guest accommodations(3) Ceiling lightsLight switchesPaneled ceiling covered in vinyl-coated fabricStructural GRP floor covered in Onyx with Wenge frameWalls with frames covered in unsealed oak woodHelm StationEasy access from the main salon is the Lower Helm Station and Distribution Panel. The helm station is perfectly situated providing great visibility and comfort. Everything you need to take you safely to your next destination is here. Ergonomically designed for easy use mixed with the style that only a Pershing can offer. (2) Electronic digital LCD engine control panel12v socket (cigarette lighter type)Aluminium panels with carbon fiber finishingAutopilotRaymarine Chart - plotterElectronic levers for engine controlsEngine and navigation control instrumentsBow and Stern thruster joystickCompassRudder angleSR trim joystickTrim tabs joystickHelm wheel upholstered in poltrona frau leatherInstrument dashboard in abs upholstered in poltrona frau leatherPilot seat in poltrona frau leatherSimrad vhf Radio - NEWGalleyPort side of the helm station down a few stairs is the galley. Nothing has been spared in this space, a perfect nook that can accommodate 6 guests comfortably while enjoying the company of the Chef tantalizing your taste-buds with culinary sensations. The opulence is continued with a beautiful finishes and designer appliances. All the comforts of home within the luxury of a Pershing. (1) Opening porthole in stainless steel and tempered glass with hook(2) Built-in ceiling spotlightsCeramic glass hob with 4 burnersCombi refrigerator (186 lt and freezer 74 lt)DishwasherElectric fanElectrical panelExtractable faucetHanging lockers in unsealed oak wood with internal shelfLight switchesLights under hanging lockersMicrowave/combination ovenRubbish binStainless steel sinkStructural GRP floor covered with Wenge stripsUnder top unit in oak with doorsInternal shelves and drawersVinyl fabric paneled ceilingWalls covered in oak/laminateWorktop in coloured tempered glassMaster StateroomAft of the guest foyeris the impressive full beam Master Stateroom that features a centerline king size berth with built-in night stands on either side. Custom fabrics and exquisite finishes creates an inviting feeling.Private access to the En-Suite Head is located aft on the starboard side of the cabin. Modern and richly appointed this expansive bath features a glass enclosed shower and excellent storage within. (2) Framed side windows in crystal(2) Opening portholes in stainless steel and tempered glass(2) Reading light(2) Unsealed oak and Wenge wood nightstand with drawers(9) Built in ceiling spotlightsAudio/video system: - Hi-fi system Bose - 22” LED TVBeauty unit with mirror and under top compartment and opening doorsCeiling covered in vinyl fabric with lacquered frameChaise longue upholstered in poltrona frau leatherDigitally controlled a/c systemDouble bed in unsealed oak wood with head border in poltrona frau leather and lockerFridgeLight switchesLocker in unsealed oak with clothes rack, internal light and mirrorSafeUnsealed oak wood dresserWalls with frames covered in unsealed oak woodStructural GRP floor covered in carpetOttoman upholstered in poltrona frau leatherMirror at aft bulkhead above bedLighting stripe underneath the bedLED Flat Screen TVMASTER BATHROOM(2) Clothes rackShower box covered in mosaic with tempered glass doorLacquered paneled ceiling(4) Built in ceiling spotlightLight switchesWashbasin in natural acrylic stoneShower faucet with double outlets with deviator(2) Combined washbasin faucetWashbasin unit in oak with opening doors(2) Opening porthole in stainless steel and tempered glassWalls covered in laminatedMatt polished Wenge strip floorHanging lockers in oak wood with doors, mirror and internal shelfWenge shower plateToilet roll holderTowel rackToilet brush holderA/C system outletElectric fresh water WC in ceramicVIP StateroomImmediately forward of the guest foyer is the VIP Stateroom. 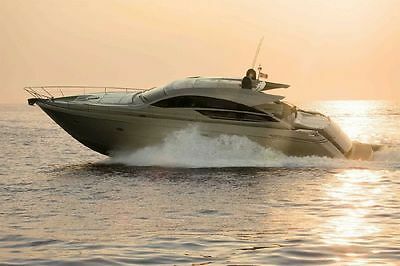 The elegance comfort and sensuous lines of the yacht are also found here. A queen island berth is easily accessible from either side. The spacious wardrobe provides ample storage for clothing. Tasteful finishes throughout with curtains that are sure to keep the light out on those late mornings in bed. Conveniently located within is private access to the En-Suite Head. (2) Locker in oak wood with clothes rack and internal light(2) Opening porthole in stainless steel and tempered glass with hook(2) Reading lights(2) Unsealed oak wood nightstand(7) Ceiling lightsAudio-video system - (2) loudspeakers - mini hi-fl cdBlinders for hatchwayCeiling panels covered withVinyl fabric and lacquered frameDigitally controlled a/c systemDouble bed in unsealed oak wood with head borderUpholstered in poltrona frau leather and locker underneathEmergency exit to upper deck from circular hatchwayLight switchesMirror at fore bulkheadStructural GRP floor covered in carpetWalls covered in oakwoodLED Flat Screen TV - NEWVIP BATHROOM(1) Opening porthole in stainless steel and tempered glass(2) Clothes rack(4) Built in ceiling spotlightsA/C system outletCombined washbasin faucetElectric fresh water WC in ceramicLacquered ceilingLight switchesMatt polished Wenge strip floorMirrorShower box covered in STD laminated with tempered glass doorShower faucet with double outlets with deviatorToilet brush holderToilet roll holderTowel rackWalls covered in laminatedWashbasin in ceramicWashbasin unit in unsealed oak wood with opening doorsCustom mosaic tile shower floorStarboard Guest StateroomDirectly starboard of the guest foyer is the Starboard Guest Stateroom. Incredible attention to detail this stateroom is comfortable and spacious fitted with twin births. The room is tastefully decorated with state of the art amenities and entrance to the private ensuite bath. (2) Opening porthole in stainless steel and tempered glass with hook(2) Reading lights(1) Single bed in unsealed oak wood with head border and sides in poltrona frau leather(6) Ceiling lightsAudio-video system: - (2) loudspeakers - mini hi-fi cdDigitally controlled a/c systemLight switchesLocker in unsealed oakwood with clothes rack, internal light and mirrorMirror at aft bulkheadPaneled ceiling covered in vinyl fabric with lacquered frameStructural GRP floor covered in carpetUnsealed oakwood nightstandWalls covered in unsealed oak woodLED Flat Screen TVGUEST BATHROOM(1) Opening porthole in stainless steel and tempered glass with hook(2) Clothes rack(3) Built-in ceiling spotlightsA/C system outletCombined washbasin faucetElectric fresh water WC in ceramicLacquered paneled ceilingLight switchesMatt polished Wenge stripFloorMirrorShower box covered in laminate with tempered glass stainless steel doorShower faucet with double outlets with deviatorToilet brush holderToilet roll holderTowel rackWalls covered in laminatedWashbasin in ceramicWashbasin unit in unsealed oak wood and opening doorCustom mosaic tile shower floorCrew Quarters(1) Opening porthole in stainless steel and tempered glass with hook(3) Built-in ceiling spotlightAccess from cockpitDigitally controlled a/c systemLight switchesLoudspeaker (2)Mini hi-fi cdPaneled ceiling covered in vinyl-coated fabricSingle bedStructural GRP floor covered in carpetStereo speaker (2)Walls covered in vinyl fabric and GRPCrew bathroom(2) Built-in ceiling spotlightClothes rackExtractable shower with mixerFiberglass floorLacquered ceilingMirrorSmall electric fresh water WC in ceramicToilet brush holderToilet roll holderTowel rackWashbasin unit with GRP topBow & Deck EquipmentWalk around decks and a large bow section makes moving around the decks a breeze. There is a lovely lounge area for guests with sun pad on the bow to take in the sun or stars. Also a great get away for privacy and relaxation, especially while at anchor.1 x 1500w capstan with foot control1 x black water pump out cap2 x dome1 x external shower1 x fresh water filling cap1 x fuel-filling cap1 x hinged circular hatchway in stainless steel and crystal glass with handle2 x 2300w windlass with waterproof control pad2 x fairlead in stainless steel2 x side Pershing logo in silicon2 x stainless steel gate for cockpit entry2 x VHF antenna2 x windshield wiper/washerAft garage for tenderFore storage with door and chain peakGalvanized anchor with join (1 x 32 kg)Galvanized chain 75mtGPS antennaHideaway aft sliding door in black painted aluminum and tempered glassHornHydraulic hideaway swim ladder in bathing platformRegulation navigational lightsSide windows in monolithic tempered crystalSide windows with electric mechanismSignal mast in stainless steelStainless steel aft handrail 30 mmStainless steel mooring cleat: - At bow (2) - At midship (2) - Stern (2)Stainless steel railingSwimming platform and aft steps in teakTelescopic hydraulic hideaway gangway with remote controlWindshield in transparent tempered glassLiferaftEngine RoomAccess to engine room from cockpit(1) Light switch2) Coupling joint between adaptor and searex flange(2) Diesel engine MAN D2842LE433 V12 1550hp - Full Service Oct 2014(2) Electric extractor(2) Engine exhaust muffler(2) Waterproof fixed explosion-proof neon light(4) Stainless steel engine exhaust raiserA/C main unitDynamic air intakesE/pump a/cGRP sandwiched stratified plank ribbing covered in anti-slip materialHydraulic oil heat exchangerHydraulic unit for gangway and garage hatchHydraulic unit for steering compartment trims and trim tabsHydraulic unit for swim ladder and aft sliding doorKholer power generator 20 kw – 230 mono - 50hz with soundproof housing - 324 appx hours - Full Service Oct 2014ASEA 18kva Shore Power and Frequency Converter - NEWPower take off on engines and reduction gearsThermal acoustic insulationPropulsion and Maneuvering Equipment(2) Hydraulic stainless steel trim tabs(2) 5 blades nickel-aluminum–bronzeElectric bow thruster and stern thruster (Stern Thruster New)ASD Surface driveHydraulic power steering systemConstruction DetailsHull: construction from mould with single skin bottom vacuum infusion. Lamination and sides in closed cell PVC core sandwich; vinylester resin. Stratification of longitudinal and transversal stringers with polyurethane core.Deck: construction from mould in closet cell PVC core sandwich format. Vacuum infusion lamination with vinylester resin Main bulkheads and interior structural floors in sandwich format vacuum infusion lamination.Structural tanks for fuel, fresh water, grey and black water, are layered with vinylester resin.Areas of the deck such as: the bow area, side decks and cockpit are covered with anti slip finish or polished gelcoat such as hull and superstructure.Areas of the deck such as: swim platform and aft steps are covered in teak sealed with polymerized black rubber caulking.Brokers RemarksShe is an outstanding example of Pershing's unique style and special attention to detail. This boat has been well maintained and is a beautiful custom ensemble that is turn key and ready to run. Don’t miss this rare opportunity to own a One Of A Kind Pershing 64' that is priced to sell! She is easy to see 7 days a week. Schedule your appointment today. nice wooden dinghy, gaff rig. 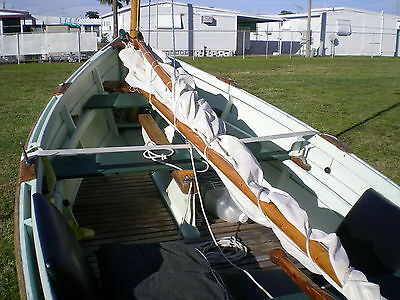 Nice wooden dinghy, good condition (need paint?) Look retro. Good mast, boum and gaff . Good sail. No motor. Aluminium oars(new).Ready to sail.